Motels Plano: Don't Forget To Pack These Items! Whether you’re coming to Plano for an extended visit with your family and friends or you’re searching for a new job in one of the area’s booming industries, you know that you’ll need your own space in which you can relax and rest after a long day of searching for jobs or taking care of family responsibilities. Luckily, Studio 6 is here to give you that space. We are an extended stay hotel where you’ll almost feel like you’re at home. In this blog, we will discuss a few things that you should pack to make your trip feel more comfortable. When you’re ready to book a room, contact us so we can get a reservation set for you. It’s always a good idea to bring a book with you when you’re traveling. Books help you fill all of the little chunks of time that you have in between appointments and other commitments, and they can help take your mind off of any stress you might be dealing with. Reading a great story is one of the best ways to relax and fall asleep at the end of the day. This is especially helpful if you have a difficult time going to sleep in a bed that isn’t your own. Our newly remodeled rooms feature full kitchenettes so you might want to bring your favorite cookbook with you! There’s nothing like having a hot, delicious meal that you made for yourself when you get back to your room. 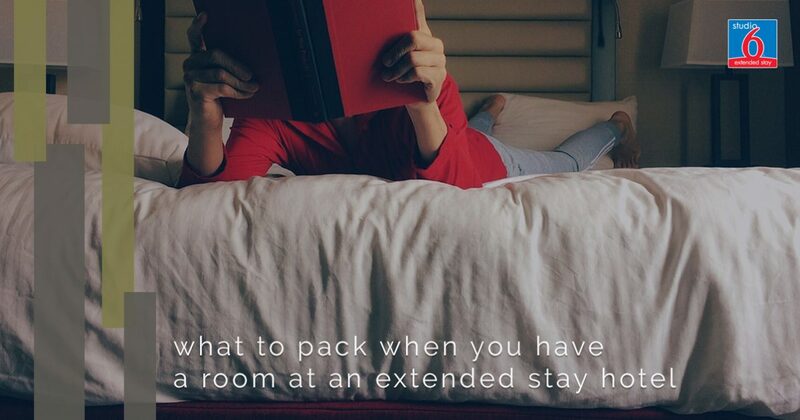 If you’re a voracious reader but you don’t want to carry a suitcase full of books with you, an e-reader is a great way to keep your thirst for knowledge and fun sated. E-readers are lightweight and can hold thousands of books (including cookbooks and audiobooks). While we probably don’t need to tell you to bring your electronics with you, we figured that a reminder couldn’t hurt. Most of us don’t leave the house without our smartphones but when you are coming to stay with us, make sure to bring your laptop, tablet, and e-reader with you. While you can probably get by with just your phone, sometimes you just don’t want to watch a streaming movie or tv show on such a small screen. If you’re working on your resume, a speech, or filling out applications, a laptop makes the process much easier. Thanks to the free wifi at Studio 6, you don’t have to worry about using all of your data while you’re in Plano, so bring your electronics so you can be as productive as you want to be! If you have a Bluetooth speaker that you can play your favorite music through, make sure to pack it and bring it to Plano. Music is a great way to feel like you’re home even if you’re thousands of miles from your own place. White noise or nature sound apps can help you get to sleep at night or recenter yourself after a long day. One of the best things about smartphones is their ability to let you carry around tons of photos right in your pocket. Sometimes there are pictures you don’t have on your phone or that are such an important part of your home that you can’t bear being without them. If you have a wedding photo or a picture of your kids that you want to have with you, bring it with! Being able to see your family when you wake up in the morning will help start your day off on the right foot! If you’re bringing framed photos, pack them carefully. One way to avoid the risk of breaking a frame is to put together a travelling photo album that has copies of all of your favorite pictures. At Studio 6, we want your stay to be as fun and comfortable as possible. Our rooms and suites are designed to help you feel like you have your own space and to give you a nice base of operations for whatever you’re doing in Plano. We’re close to many great restaurants as well as several universities and the Plano Medical Center. Call us today to reserve your room!